In a secret world where racing is king, human-like rhinos live to race the fastest rat-rods throughout the vast outback known as "Koala Kanyon." Friends Revin' Kevin, Otto Gauge, and Deezul face off against the terrible Toein Twins, Castor and Camber. Community elders, including Dwite Mite, give the Rhynotz kids their first big chance to design, build, and race their "rat-tastic" hot rods on menacing Monster Truck Mountain. Facing numerous challenges, the Rhynotz kids will be tested like never before. Character Description: Socially awkward and quiet, possesses superior intellect, gadget and technical wizard; holds secrets to design, building, and racing of all types. Friends: Deezul, Revin’ Kevin, and Kandi Karbi, but Otto is easily likable and friendly to all. Favorite Type of Racing: Otto loves all types of racing, but what he enjoys most is when all vehicles, rules, and regulations are equal among all competitors. This allows for his brilliant mind to shine and usually win. Otto loves the technical wizardry! Favorite Rides: Otto digs Woody Wagons complete with surfboards, but he enjoys building sleepers where all of the engine remains under the hood and defeats unsuspecting drivers. Alternate Likes: Outside of Racing, Otto enjoys mathematics, making up new games with characters and rules, bike rides, exploring the old army field, and map reading. Character Description: A loyal supportive friend; muscle bound, natural athlete who doesn't know his own strength; limited automotive knowledge; always willing to help out friends and expand mechanical/racing skills. Favorite Type of Racing: Loves quarter-mile drags and mud bog racing. Favorite Rides: Loves big torque diesel trucks and rat rods with diesel motors; loves to "Roll Coal"
Alternate Likes: Likes to build cool and different rides with his best friends. Likes to lift weights. Often heard through Koala Kanyon saying, "To make it look good, you’ve gotta push it through the hood!" Character Description: Reliable and trustworthy friend; thoughtful of peers and elders, follows the rules, takes pride in being a good example; go-to guy to resolve conflict. Favorite Type of Racing: Loves Top Fuel Drag Racing, especially 10,000 horsepower Nitro Funny Cars. Favorite Rides: Loves '70 Plymouth Barracudas, '68 Dodge Chargers, early '70s Dodge Challengers. He also enjoys '69 GTOs and '68 Chevelles. Alternate Likes: Kevin enjoys designing and building all types of vehicles, but also enjoys football, movies, and watching the grown-ups race on the different tracks in Koala Kanyon. Character Description: Tomboy, preteen, tag along, lil' sis to Revin Kevin; immaturity and inexperience frequently creates mishaps and failures as she demands inclusion in the boys' race adventures. Friends: Of course her big brother Revin’ Kevin! Then there’s Otto Gauge, Deezul, and her girl car club the "FireFlys"
Favorite Type of Racing: Anything with her big bro! Favorite Rides: Kandi is a little too young to drive yet, but her dad and big brother are already working on her future vehicle, a VW Bug van, so all of her "FireFly" friends can pile in and head to Crocodile Nile beach to surf and boogie board! Alternate Likes: Likes to make her own jewelry out of found mechanical parts. Enjoys bike rides with her friends. Enjoys painting and drawing, hanging out with friends, and hitting the beach at the Crocodile Nile. Character Description: Dominant, intimidating, and selfish; self-proclaimed know-it-all; hides incompetence behind a hostile persona; lies and breaks rules to win at all costs. Friends: His twin brother Camber is his closest friend. Castor would like more friends but won’t admit it. He has a hard time showing feelings and being nice because he believes if he shows kindness others may not think he’s tough. Favorite Type of Racing: He enjoys all types of racing, but it’s most important to him to dominate and win by any means necessary. Favorite Rides: Mega Monster 4x4 Trucks with 66” tires; quarter mile nitro-burning top fuel dragsters. Alternate Likes: Working with his hands on hot rods with his dad and brother. Also enjoys football and basketball. Character Description: Stammering twin brother to Castor; eager to impress and secretly hides true feelings to avoid Castor's ridicule; desires friendship over adversaries but is intimidated by Castor's ruling agenda. Friends: Castor Toein (twin brother). Camber has a hard time making friends as his desire to win comes before being nice to others. Favorite Type of Racing: Camber enjoys all types, but prefers straight line drags, especially after his first experience in the Big 8 Race with his brother. Favorite Rides: Likes monster trucks and rat rods but also enjoys old big fin cars like ’59 Caddys with bullet tail lights! Alternate Likes: Hunting for parts with Castor in Koala Kanyon to build cool things and re-purpose items; bike rides with his brother. Catch Phrase: "Hey, Big Buddies!" 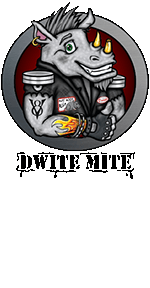 Job: Dwite Mite is the owner/overseer of the "Koala Kanyon" junkyard. He's so proud to have been given this job that he promotes it every chance he gets and even named it "Dwite Mite's Junk Emporium." Dwite lives in his hand-built house in the junkyard. He can be heard frequently across Koala Kanyon banging, grinding, or dismantling cars; sometimes without tools and only with his bare hands! What He's Like: Dwite appears intimidating at first look with a silver-colored mohawk and anvil goatee, leather motorcycle vest, and car-related tattoos. He is a big, muscular rhino, with really big hands and feet, a large belly and a deep throaty voice, like a V/8 engine with dual exhaust cherry bomb mufflers! Dwite is a little goofy but always friendly and shows kindness to all he meets. He especially looks out for the kids in Koala Kanyon. He loves to see the kids in the junkyard and always lends a helping hand, showing the kids the proper way to use tools safely to get the job done right! He even loans out his special tools to help the kids get the right parts for the right car to build their rat rod race cars. 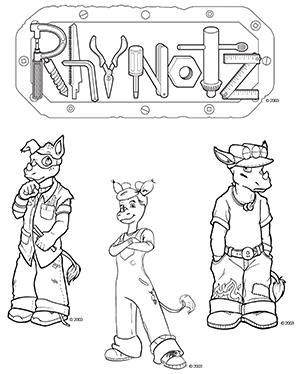 Click the image to download your FREE Rhynotz Characters Coloring Book! 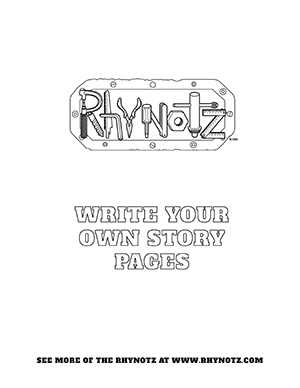 Click the image to download your FREE Rhynotz Write Your Own Story Pages!